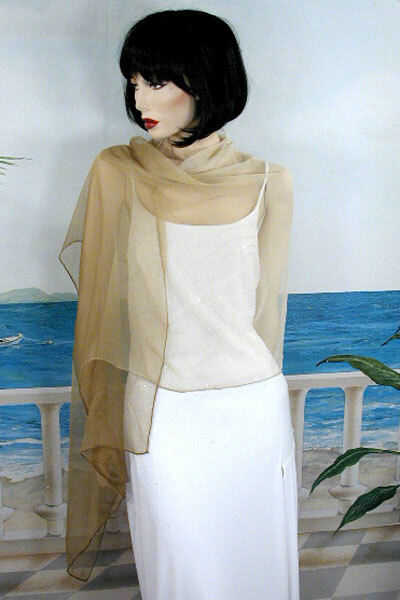 Pure Silk Scarf or Light Shawl Wrap Pure silk sheer chiffon scarf or light shawl. These scarves have a bright color on one side which blends to a lighter shade on the other. The sheer silk fabric is fluid and drapes well. They are a lightweight wrap that looks wonderful with an evening dress. They are the perfect solution to covering bridesmaids shoulders during the ceremony. Color: tan Hue: Code: #CDA565.